I sew a water bottle holder this morning. 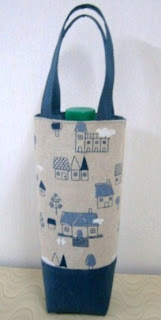 The cute little blue cottage fabric I used was bought from an online shop last month. It is Japanese cotton linen blend fabric. The dark blue linen fabric was bought from a local fabric store. I used the same blue linen fabric for the lining. This water bottle holder is for my hubby. His favourite colour is blue. Well, I am happy that he likes this little stuff I made for him. It can hold a thermal flask as well. Thanks for visiting and wish you have a relaxing and happy weekend ! Hi, I am PY. Welcome to my blog and thanks for stopping by. Please ask my permission to use any content from this blog. Thank you!